British Pie Week is held the first full week of March, which this year is 6th-12th March 2017. Originally set up by a pastry maker as a way to sell more of their pastry, it is now Britain’s main celebration of pie! Pubs, restaurants, pie shops and more have used British Pie Week to run com-pie-titions, pie specials and the like (so why not ask what your local pie-selling pub is doing to celebrate pie week? ), while supermarkets sometimes use the week to discount their pie ranges. The British Pie Awards have even moved their awards to this week, to coincide with British Pie Week. Well, the pies the limit! Of course the more traditional ways include eating a pie from a pie shop or pub, or making your own pie at home. The more adventurous might host friends for a “pie night” – much like we are for our Pierate Birmingham Pie Night – or do some crazy pie stunt like only eating pies for a day (which we’ve done numerous times) or create an unusual filling for a pie – like we did with our Pie-thon (python meat pie). This means the new home of British Pie Week is really www.pierate.co.uk, who don’t care about making money or selling more pastry, but want to celebrate the pie – with almost 600 pies already rated and numerous pie-related stunts highlighting their love of pie! For more information on what Pierate have got up to over the years since first celebrating British Pie Week in 2011, check out our dedicated British Pie Week page! 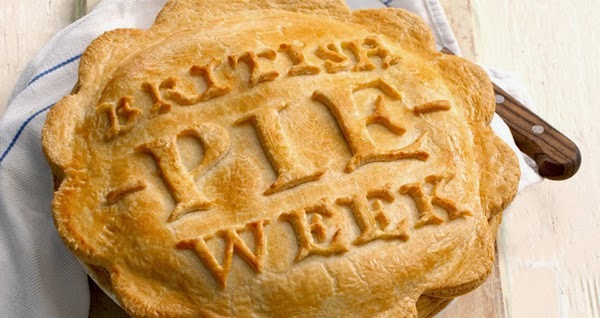 Well, if you haven’t already, we’d suggest you take a look at our Countdown to British Pie Week article! There you can find a countdown timer to tell you to the second exactly how long you have left to wait until British Pie Week 2017, alongside other useful Pie Week info! In addition, you can browse our Pie Rankings of almost 600 pies rated and ranked so that you can avoid the bad ones and grab the best ones, plus we have a pie pun dictionary (so you can pun-ctuate your conversation in pie week) and more pie trivia than you can shake a stick at! We truly are the home of the pie review at www.pierate.co.uk and you can find out more about the piefessionals (pie experts) in our About Us section!